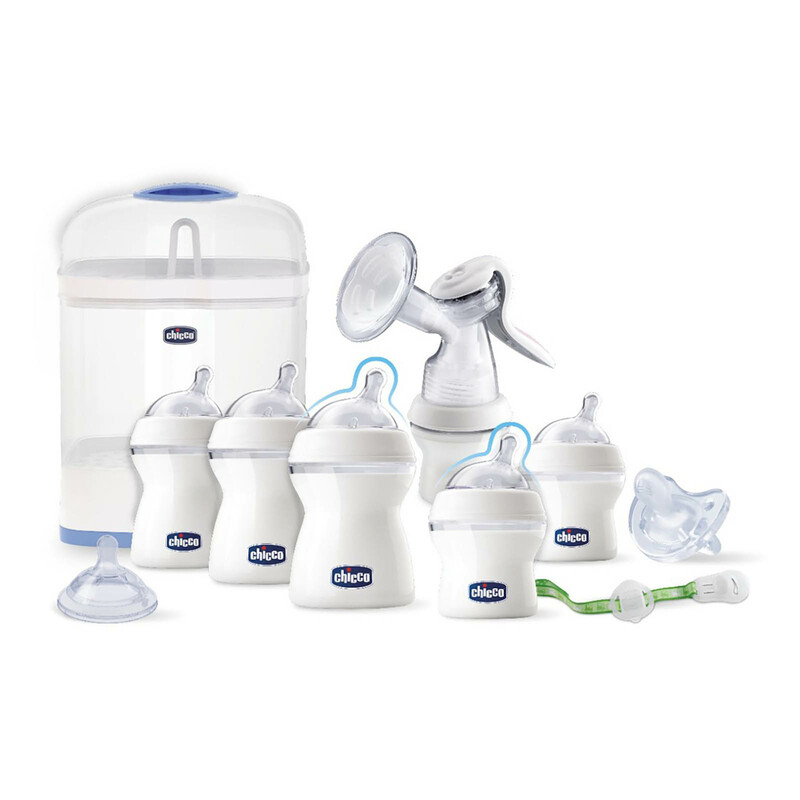 Providing you with everything you need to start feeding your baby (with the exception of Mum of course) the Natural Feeling Starter Set from Chicco includes 5 bottles which have been specifically designed to replicate the instinctive way baby feeds. Because the feeding experience should be as easy and natural as possible, the angled teats on the feeding bottles ensures correct and intuitive suction, (just like at your breast) giving you that all-important peace of mind. The included breast pump is easy to use and stimulates milk flow with the soft ergonomically designed massage cushion. Also included, comes the electric steriliser which is perfect for keeping all your bottles and accessories hygienically clean, free from bacteria and safe for your baby until their immune system is strong enough to cope by itself. 2x Bottles (5oz/150ml) with slow flow teat. 3x Bottles (9oz/250ml) with slow flow teat. 1x Variable flow teat, specific for 3 m+. 1x Physio Soft soother, made of 100% ultra soft silicone, perfect for night & day use. 1x Manual Breast Pump, approved by 91% of mums. Extra gentle and effective, to breastfeed for longer. 1x Electric Steriliser SterilNatural 2in1. It can be used full size or compact, according to your needs.